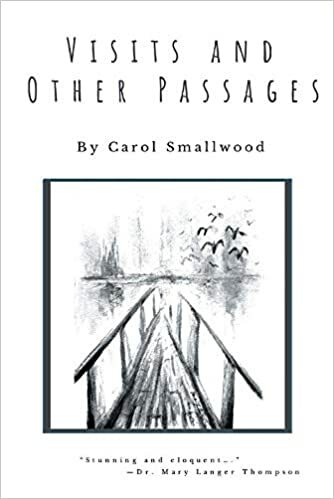 In her latest of over sixty books, the prolific Carol Smallwood serves up a feast of genres in a hybrid of fiction, poetry, essays, letters, and other vignettes that exemplify her career-long mastery of exquisite close observation. These fresh and widely varied selections play like a documentary film about visits and revisitings, the feelings of loss and passage, and the ways we can either miss totally or experience more fully the process of living as it unfolds. Smallwood—always a master of character—sends her narrators on simple quests that will change the way we see everything and introduces us to an array of fascinating folks who drop by for visits that we don’t want to end. Like most of her collections, Smallwood’s latest is almost always about the creative process itself as we live it in our everyday experiences and try to capture it in writing and reading. In an interview four years ago, Smallwood suggested that “writers do most of their work when not actually writing; thinking is where it boils. The subconscious is the mother of all.” In fact, the most crucial times in her way of writing occur when she does not appear to be writing at all. Ideas come while daydreaming or washing dishes and then need “brooding time” to “mull over” what she calls “the incubating bits” which “appear to have no connection until when one is at last ready, the seemingly loose ends can be fit together” (“Arriving at the Aha Moment,” 75-76). The mulling over time also forges the connections between the actual process of writing and the rigors of paying attention to details we generally overlook. In her Introduction Smallwood quotes Heraclitus (“We are estranged from that with which we are most familiar”) and sets out to reconnect herself and readers to the passages and visits we live through every day. Enter writers who “see things with fresh eyes (“Perspective” 46) and give readers a chance to recover from the self-induced blindness of familiarity: “What we see in everyday life is often limited from seeing it so often: people become part of the furniture.” Hence we need the aesthetic sensibility that defamiliarizes what would otherwise never get beyond mere ordinariness to “what is there just beyond reach” “Sleep,” 33). Smallwood’s defamiliarization includes works that take a closer look at what is easily missed—concentrating on the passages we encounter and the visits and revisitings that show how we participate in community. Close ups include a fly eating a morsel of fruitcake near her keyboard, deliberations about how to handle mounds in the lawn, members of a spice-shelf brigade standing for military formation, a tea party with a treasured vintage doll, looking at clocks for more than the time, and the art of folding napkins like J. Alfred Prufrock would do it. The most notable visits to include the dentist, Aunt Heidi’s, the supermarket, and the library; visits from feature friend Polly and an unsuspecting Avon Lady who never knew what hit her. The “revisiting” poems include significant discussions of memory and the spirit of place. Other selections pause over a brief and fascinating history of libraries, the shifting of continents, thoughts on the evolution of cornfields, and a show-stopping recollection of her Uncle Walt’s funeral. The collection is rounded out by a series of short essays on various authors and other subjects. While interesting in themselves, some short discursive and less illusive reflections don’t always find their right place alongside the other more successful pieces. In her Foreword to this volume, which she calls a travel narrative, Su Epstein identifies what is “comfortingly familiar, fascinatingly foreign, and intellectually thought provoking” as “a life lived” sneaks out from behind the narrator’s magnifying glass. In “One December Day,’ a maestro fly walks to the podium for the volume’s overture as it nibbles “ fruitcake with an occasional kick of the leg.” More close ups come into view as the narrator struggles to address the problem of mounds taking over her lawn. Rejecting outright killing, she decides on sonic rockets that would trigger swift and thorough evacuation. This plan too is vetoed by “dreams of families forsaking homes” to become “the underground homeless,” and in the end profoundly mundane activities are left to unfold: “Don’t let your molehills become mountains” (“Mounds Keep Appearing,” 10). The villanelle “The Last Doll” introduces us to a long-haired beauty who sits with two other Christmas presents, ruling over them perhaps because “she’s not been held as often for validation” (“The Last Doll,” 32). Soon we see Prufrock folding napkins in fast food restaurants, pause at a three-month cancer check-up where we endure “the smile for the aged,” and find ourselves reading a letter to God exploring why we keep on thinking “everything revolves around” us and go on to “kill each other especially in your name.” And then there is the unforgettable spice shelf in every store where those iconic jars “stand at attention facing you always on parade.” Again all around us where so much is too familiar to see, “there’s tales worth knowing” if we “just look” (“There’s Much to See,” 45). Just as these altered perspectives defamiliarize what would otherwise be lost in narcoleptic ordinariness, many of the varied genres in this volume infuse vibrance into ordinary visits that make up much of daily life. In Smallwood’s hands, a visit from the Avon Lady is whimsical and poignant. This visitor shares not only products and calendars but updates on her grandchildren, her sister who “still doesn’t know her place” at the age of 45, and a battery of questions intended to “welcome” new customers to the neighborhood. As an extension of the passage motif of moving away from one’s home and into a new neighborhood, “Polly’s Visit” brings an assault of unpleasantries from someone who tries to stop the passage of moving on from divorce, poverty, and the death of a spouse. Some of the best selections in the volume about passages are portraits of those jealous of others who are moving on. “Lunch at Aunt Heidi’s” is another prickly trip down memory lane as the narrator fends off advice about battle fatigued returning veterans, Heidi’s life with Uncle Walt, and polite exchanges about the benefits and destructiveness of religion. When the narrator shares stories of a Vietnam Vet scarred for life. Heidi advises that he “drink prune juice for iron and pray.” Even a trip to the dentist is grist for Smallwood. “Give me all the shots you can,” she says to “the masked man” who looks like Zorro or the Lone Ranger and dispenses pain medication like candy. Inviting readers into its variety of places and perspectives, Visits and Other Passages successfully defamiliarizes ordinary events so we can reconnect with the lives we are experiencing. Clocks reveal more than the time of day. Napkins in fast food restaurants and spices on grocery shelves have stories to share. Smallwood’s poems, stories and vignettes are rooted in the two-fold belief that “we are usually too much a part of our setting to be very conscious of it” (“Location and Character”) and that creative estrangement from what has gotten encrusted in ordinariness can be learned. For readers of this book, dentists’ waiting rooms will never again be the same. Wonder may be restored once more to corn fields, supermarkets, libraries, and front porches. Smallwood’s defamiliarization moves forward strikingly as she attends to so much that is generally overlooked. A postcard from a funeral director urging her to “PLAN AHEAD WITH PIZZA” is read carefully on its way to the wastebasket: “It was good it was sent to RESIDENT–/it discouraged being selected as a/prime candidate for the Grim Reaper” (44). There’s the Avon lady’s hair that “looks just like the wig called ‘Caesar’s Wife’ in a catalog”(1), colorful puzzles on placemats at Wendy’s” (12), and the oft overlooked spiders whose intricate work created the first ever curtains in her new home” (23). Readers used to poetry collections or volumes where the prose knows if it is fiction or nonfiction might at first be perplexed by the way genre boundaries are transgressed or redrawn this time around. But my bet is that those who come with a spirit of adventure will be rewarded by the irreverence and innovation on almost every page. Visits and Other Passages provides enough threads of a motif that knits up a quest myth, patterns of loss and recovery, and the power of visitation. The language is fresh throughout and constructs mastery of form and characterization. A half dozen or so selections could have been cut, and the editing misses a few too many errors. The cover design creates simple elegance. About the reviewer: Ronald Primeau is Professor Emeritus of English, Central Michigan University and Adjunct Instructor at The University of South Florida Sarasota-Manatee.